I can play the didgeridoo. Mr. and Mrs. Twit (from The Twits, by Roald Dahl). They are horrible in every way - especially to each other - but hilarious! Nigella Lawson, Jeanette Winterson. Jumpha Lahiri, Jackie French and BKS Iyengar. The food would be great and the conversation fascinating. Plus, we could all do a little yoga after dinner! Enid Blyton’s Faraway Tree! I would love to have friends like Saucepan, Moon Face and Silky! It would be so exciting to explore the different lands at the top of the tree, and to come down the slippery slide on a cushion afterwards! Inspiration. Imagination. Intuition. Trust. Connection. She wrote from the heart. Tea. Licorice allsorts. A comfy chair. Laptop computer. Earplugs. Born on a Blue Day by Daniel Tammet. Years ago I met my favourite author, Jeanette Winterson. I was so nervous that my mind went blank and I completely forgot all the things I had wanted to ask her. I still can’t remember them! That’s a bit of a mean question to ask a writer - we can’t live without either! But I guess if I had to choose one it would be to stop writing, because I could never stop reading! 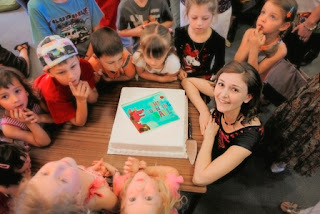 Deborah Kelly is an Australian children's author and poet. She has written picture books, short stories and junior fiction novels, and her work includes The Bouncing Ball, Jam for Nana, and Dinosaur Disco. She has also published a book of haiku, Haiku Journey, inspired by her time living in Japan. 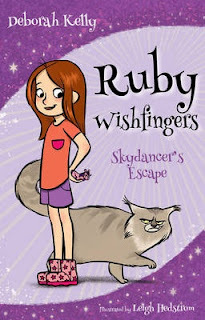 Her latest story is the first book of a new junior fiction series, Ruby Wishfingers: Skydancer's Escape, illustrated by Leigh Hedstrom and published by Wombat Books. Visit Deborah's website and Facebook page for more information about her books and author events.